This is a stunning chart. The North Node in the ninth house straddles the Galactic Centre, closely conjunct the Capricorn MC. Pluto also conjunct the MC, rides high in the chart in the tenth house. To me this suggests that our world community is pushing towards a new vision, forged in a realism which has been forced to recognise the need (which now must be obvious to all but the most obtuse and escapist of us) for re-structuring the way we conduct ourselves in relation to our roots and origin: Cancer, Mother Nature herself. The ruling planets of both IC and MC, Moon and Saturn, are conjunct in the seventh house. This points to the necessity for discipline, realism and persistent hard work in collective partnerships with our fellow humans if we are ever to achieve a world order which is not rooted in planetary degradation which ultimately threatens to get rid of us – the most brilliant, most destructive species ever to have colonised planet Earth(as far as we know!). Will this restructuring be orderly, calm and measured? Absolutely not! No less than seven cardinal planets, four of them in fiery Aries in the first house, reinforce the current sense of angry urgency for taking new initiatives which is palpable across many levels of our human community this Spring of 2011. The Sun of the year exactly conjuncts Uranus. 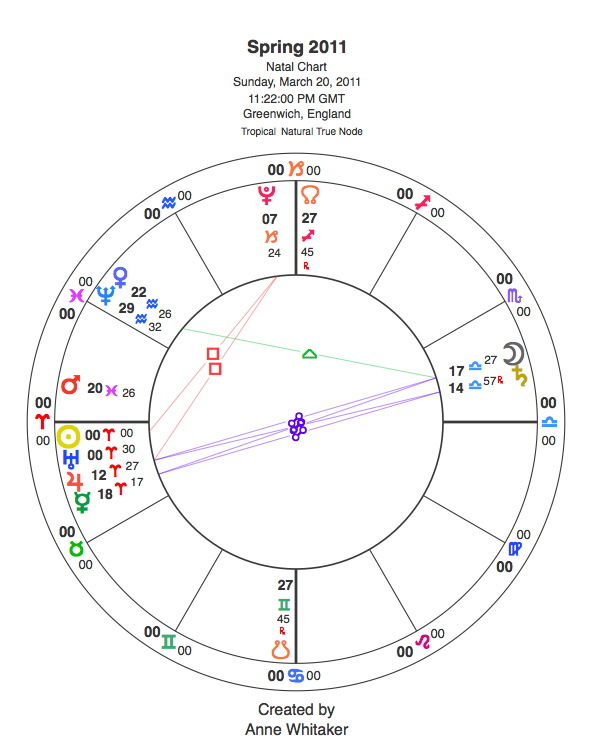 Many astrologers will be pointing out that the turbulent and high-focus first/tenth house Uranus/Pluto square, not exact until 2012/15, is likely to bring major turmoil and upheaval, violence, bloodshed, death of old structures and fiery birth of the new – and out of all that, a new order in the world. Extraordinary events across the Middle East in recent weeks, and Japan yesterday, testify to these beginnings. This is the first square of those two planets since the 1965/6 conjunction at the heart of the revolutionary 1960s. The American and French revolutions of the latter part of the 18th Century – 1776 and 1789 – took place at key stages of the Uranus/Pluto cycle which began in 1720, with that conjunction reflecting the the turbulent birth of the Agrarian and Industrial revolutions in Europe, a process which was ultimately to change the entire world. There is, and will continue to be, much informed and wide-ranging commentary on these changes, briefly sketched above by way of introduction, emerging from our astrological community. My own particular interest is in the 2010/11 Jupiter/Uranus conjunction, potentised by its square to Pluto, which is so powerfully placed in the first house of this Spring Equinox chart, set for Greenwich, England – the locus for Greenwich Mean Time. Jupiter/Uranus is now settling into a new 14-year cycle, continuing with its ancient symbolic task of seeing no limits as it challenges old frontiers and reveals startling new vistas of experience and discovery. As a human community, we have begun a new voyage into the Unknown. Comfort and security are never key features of such voyages…. In 2009 I had a book published called “Jupiter Meets Uranus” which explores the conjunction in detail, presenting original research on the impact of the 1997 conjunction both individually and collectively as well as setting Jupiter/Uranus conjunctions in their mythological and historical context. I have also created an archive of articles and research focusing on the 2010/11 conjunction. Anyone wishing to explore Jupiter/Uranus conjunctions in depth will find the archive and book details at www.jupitermeetsuranus.wordpress.com. “The old order changeth, yielding place to new…..”. This entry was posted in Astrology Article Archive 4 – Spring Equinox 2011 and the Big Picture and tagged 1965/6 Uranus/Pluto conjunction, 1997 Jupiter/Uranus conjunction, Agrarian and Industrial revolutions, “Jupiter Meets Uranus”, Galactic Centre, Jupiter/Uranus conjunction 2010/11, Jupiter/Uranus conjunctions, Jupiter/Uranus14-year cycle, Mother Nature, poet Alfred Lord Tennyson, Spring Equinox horoscope 2011, Spring Equinox: 20.3.2011, Uranus enters Aries 2011, Uranus/Pluto cycle 1720, Uranus/Pluto square 2012/15. Bookmark the permalink. Pingback: Spring Equinox 2011 and The Big Picture « "Jupiter meets Uranus"
many many thanks to you for this affirming and uplifting comment, just at the point where I can really do with it! I am going to cut and paste the bit about my researchees and send it to them – they have been so generous and persistent in seeing the project though and it is most interesting to see the March 2010-March 2011 summaries beginning to come through. So – it’s great to know that you and your team will be accompanying me and my 10 volunteers on the last leg of this journey. howard sasportas called the outer planets the gods of change.great book too.i needed to add that .thank you. good to hear from you and thanks for this thoughtful and apt comment. Before my 2001-8 health crisis caused me to quit astrology teaching, I used to keep a file of images cut from the newspaper front pages following the day of major planetary shifts. The year that Saturn last moved into Pisces, for example, there was a wonderfully stark image of a huge ship beached after a major storm. And when Pluto moved into Sagittarius – the front pages were on fire with terrible images from the Kobe earthquake. That same day, Pope John Paul preached to his biggest audience ever – a million I think – in Manila. The planets speak. They have just eloquently spoken again as Uranus entered Aries. But are we listening? by Howard Sasportas, a wise, eloquent and well-written classic which no serious student of astrology should be without. Thanks for bringing it to our attention! Pingback: Big Picture series Part Four: Jupiter/Uranus conjunctions through Aquarius « "Jupiter meets Uranus"